This years Opener is going to look a lot different than lasts! The snow is gone, the river isn’t low, but its not high either. With no snow left in the woods, the spring melt is already behind us. We can expect good fishing conditions well in to the foreseeable future. Steelhead will be on gravel soon, trying to produce future generations of Wild Brule River Steelhead! Our Steelhead numbers have been down 2 of the past 3 seasons, the fishery is still in good shape, but we as anglers can do a few things to help it bounce back as quickly as possible. If you see fish up in shallow water, on gravel, they are spawning! Please leave them alone to preform this right of Spring that insures generations of Steelhead to come! Respect other fisherman, the landowners and the fish. 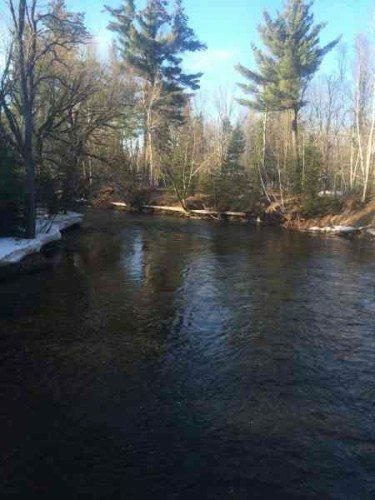 This entry was posted in Fishing Reports and tagged brule, brule river fishing report, Brule river steelhead, fly by night guide service, RIO, sageflyfish, simms, steelhead by Damian Wilmot. Bookmark the permalink.